Emory has been ranked in the top twenty by U.S. News & World Report since 1994 and is now tied with Vanderbilt University in Nashville, Tennessee. Princeton placed first in the rankings, followed by Harvard and Yale. Goizueta Business School advanced five slots in this year’s U.S. News rankings to be rated thirteenth nationally of undergraduate business programs. “We are honored to be acknowledged for the strength of our globally recognized faculty and strong student experience,” says Dean Larry Benveniste. Emory’s rankings on the U.S. News survey components include fifteenth in student selectivity, four out of five in academic reputation, twelfth in faculty resources, sixteenth in overall financial resources, and twenty-fifth in graduation and retention. At twelfth place in faculty resources, Emory had a higher ranking on this measure than Johns Hopkins, Dartmouth, and Stanford. Emory was twenty-first among universities offering the best value, based on academic quality and the net cost to a student receiving the average amount of financial aid. The University ranked fifteenth in alumni giving, with an average of 36 percent of alumni contributing to the school. An impressive alumni support rate helps the University “receive major grants and win the sincere confidence and respect of current and potential students, the academic community, and the rest of the world,” says Associate Vice President for Annual Giving Francine Cronin. 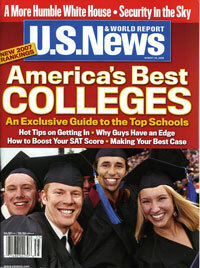 The Kaplan/Newsweek guide includes Emory among a first-time list of twenty-five “New Ivies”—colleges whose academic programs, combined with a population boom in top students, have fueled their rise in stature and favor among the nation’s most desirable applicants, administrators, and faculty, edging them to a competitive status rivaling the Ivy League. The designation is based on admission statistics as well as interviews with administrators, students, faculty, and alumni. Emory was the only school in Georgia named to the list and one of five Southern schools. The guide notes that in 2005, “applications to Emory climbed 18.5 percent from the previous year and came from all 50 states. . . . Students often cite Emory’s Atlanta location.”—M.J.L.